Three decades ago, Neil Young sang “It’s better to burn out than to fade away.’’ He neglected to mention a third option, the one he’s living out: Stay ornery and don’t quit the stage until they have to drag you off. 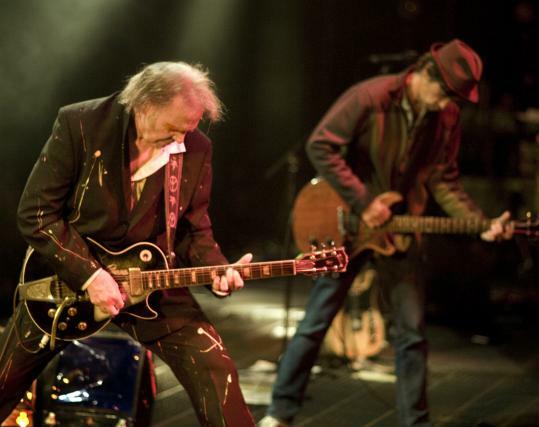 Thus Jonathan Demme’s “Neil Young Trunk Show’’ is something of an answer record to “Neil Young: Heart of Gold,’’ the lyrical in-concert love-fest the two men made in 2006. There the vibe was acoustic, nostalgic, therapeutic — Young had recently survived a brain aneurysm and was looking at the big picture. He knew “Old Man’’ was about him now. “Trunk Show’’ says, in effect, screw that. Filmed at a 2007 concert in Upper Darby, Pa., the film’s a showcase for Loud Neil, the shamanic high-decibel half of his personality that erupts on records like “Ragged Glory’’ and “Weld.’’ Taking the stage with a band anchored by the stalwart Crazy Horse drummer Ralph Molina, Young creates stomping, thudding maelstroms of guitar noise, thrashing about as if he’s plugged into an electrified fountain of youth. Hey, kids, this is what it sounded like when dinosaurs roamed the earth. At the same time, and as is true of many concert movies, “Trunk Show’’ is proof that you probably have to be A) a serious Neil fanatic, B) someone who was there, and C) high. The version of “Spirit Road’’ (off Young’s recent “Chrome Dreams II,’’ an album that reconstructs one of his long-lost works in progress) encapsulates everything wonderful and wearying about the man: Young reels off a massive, fuzz-drenched, shambolic guitar solo, and then another, and then another, until the song is surging against the 20-minute mark. At one point in the screening I briefly drifted off, and when I woke up he was still soloing. Does it get boring? Of course, partly because Young makes no attempt to engage the audience when he’s communing with his muse. He lowers his head and tilts into the solos like a bull ramming a fence. Young has a terrific sense of sonic dynamics but he has never been a virtuoso or one of the phallic fretboard gods. Rather, he’s an endless seeker after the rock grail of transcendence. The guitar’s his crutch, his gun, his cross; each solo’s a mandala and sometimes the details are hard for us to make out. Demme’s nimble cameramen scamper everywhere to capture the show; during one song the screen splits into nine panels for all views at once. “Trunk Show’’ also lets us backstage, where we see Young’s doctor patch up a split fingernail and send him back out into the trenches. Is that blood on Neil’s shirt? Probably, although it could be paint; in another reminder of this musician’s ’60s roots, artist Eric Johnson is posted at the rear of the stage daubing oils onto canvas throughout the concert. The movie’s not all glorious noise. Young takes time out on the acoustic guitar and piano for such standbys as “Harvest’’ and “Oh, Lonesome Me.’’ The high point may be “Ambulance Blues’’ from 1974’s “On the Beach,’’ one of the all-time great works of California pessimism. As he sings the angry, defeated lyrics and wheezes through the harmonica solo, it may occur to you that Young’s finally as old as he always wanted to sound. You can still see the mysterioso young rocker, though — the guy who made Crosby, Stills, and Nash look like the wimps they were — peering through his grizzled mountain man’s face. The moment passes. Soon enough Young is slamming into a 12-minute version of “Like a Hurricane’’ and thrashing through another endless series of solos. He won’t stop; why should he stop? He knows what awaits the aging rock and roller who turns off his amp.